One of the University of North Texas Health Science Center‘s most prominent researchers and professors was recently awarded with a prestigious award in his research field. 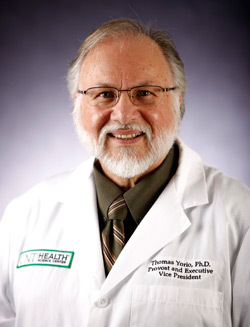 According to a recent UNTHSC press release, Dr. Thomas Yorio, PhD, who also serves as the Provost and Executive Vice President for Academic Affairs, has been awarded the Ernest H. Bárány Prize by the International Society for Eye Research. Each year, the prize is presented by the International Society for Eye Research to a researcher in the field of ocular research whose contributions in the lab have led to a substantial increase in the understanding of ocular pharmacology, particularly as it relates to the understanding and treatment of serious eye diseases and conditions, such as to glaucoma, diabetic retinopathy, macular degeneration, or related retinal diseases. The Ernest H. Bárány Prize will be presented in July to Dr. Yorio at the XXI Biennial Meeting of the International Society for Eye Research in San Francisco, CA.